Bungie have provided some patch notes on what will be changing with Arc week, so let’s dive in and give them a look. Broadly speaking we’re going to see Mayhem return to the Crucible, and we’ll have special Arc Bounties to complete in that mode. The quest for the Exotic Submachine Gun, Thunderlord, is also going to return for the week. If you don’t already own the weapon here’s our guide on how to get it in one, two, three steps. You should also check out our overview of the Destiny 2 version of Thunderlord. After Arc Week you’ll only be able to get Thunderlord from Exotic Engrams. Four new weapons are being added as drops from Nightfall, Strikes, and Crucible match completions. They are as follows. 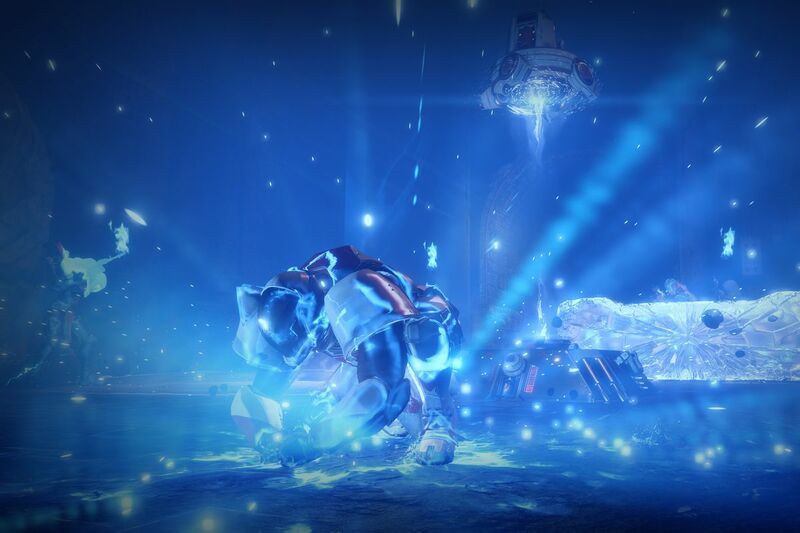 As part of Arc Week Gambit Prime invasions have been nerfed, so any kills made by invaders will heal the Primeval by 8 percent instead of 12 percent. All four Weekly Bounties will now also grant Powerful Helmets. The Subclass changes coming with Arc Week have been teased by Bungie, what they’ve revealed so far is as follows. All Stormtrance damage will now scale up to 150 percent over 5 seconds, and visual and sound effects have been updated to reflect this. You can now chain up to five enemies together with Chain Lightning Melee. Each enemy can be hit twice, and the damage from each hit has been decreased to 31 percent from 50 percent. It’s now possible to chain many more targets together with Arc Web, and you can hit them back and forth. The range of Arc Web has increased to 12 metres. Your Grenade cooldown will also now be reduced when chaining electric damage with either Arc Web or Chain Lightning. There’s now an increased bonus regeneration of Rift by 600 percent per friendly Guardian when using Electrostatic Surge. You’ll get a UI notification when the Rift is active, and it’ll last for 20 seconds. The duration of Arc Soul has now been extended by 50 percent. The amount of Super gained from Everlasting Fire has been tuned so that it grants an initial return of 13 percent, which will decay until it reaches 0.75 percent per kill. The cost of charging a detonation has been reduced by 20 percent. Holding a charge now costs 7 percent less. Getting a full charge now takes just 0.7 seconds. The cost of Dark Blink has been reduced by 20 percent. The duration of Voidwalker Super has been increased to 22 seconds. Combination Blow can now be stacked three times. The buff now increases melee damage by 60 percent in PVE and 22.7 percent in PVP. Kills will heal Hunters for 40 health and trigger regeneration. The buff duration for Deadly Reach has been increased to 8 seconds from 6, and will no longer be consumed with a melee strike. The disorientation distance for Disorienting Blow has been increased by 50 percent, and lasts for 2 seconds in PVP. The dodging recharge bonus while sprinting from Focused Breathing has been increased by 100 percent. The bonus granted to grenade and melee regeneration while Bloodied from Combat Meditation has been increased by 25 percent. The damage resistance granted while dodging using Lightning Reflexes has been boosted to 40 percent in PVP and 70 percent in PVE. All weapon damage is increased for the duration of the buff during Frontal Assault by 25 percent against combatants and 20 percent against players. The duration of the buff has been increased to 16 seconds, with a timer that will display on your HUD. Melee damage bonus for Knockout has been increased to 60 percent. Once 60 percent damage has been reached then a shield will pop, with any damage after that refreshing the timer for Knockout. Knockout is no longer consumed after one melee attack, and the duration has been increased to 5 seconds. The full patch notes for Update 2.2.1 should be revealed tomorrow when the patch is scheduled to launch. Let us know what you think of the update, and Arc Week, in the comments.